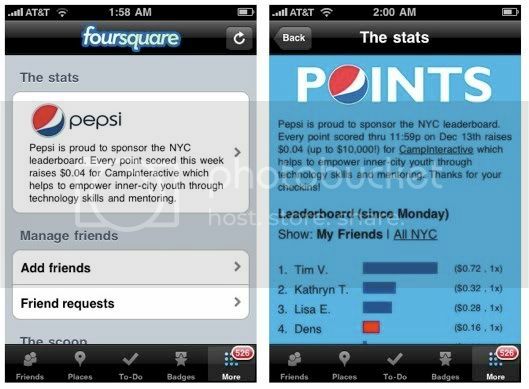 The big news so far this week is that location-based social network, Foursquare, has sold its New York leaderboard to Pepsi. And all for a good cause. For every point added through December 13th, CampInteractive, which empowers inner-city youth with technology skills and mentoring, gets four cents. It’s hopefully the beginning of a long line of cause marketing initiatives using Foursquare, something I’ve written about before. Like you, I’m eager to use Foursquare for cause marketing. Here’s what I’ve learned since I last wrote about it. Foursquare is what it is. It’s nice to think about all the cool add-ons you could suggest to Dennis and his team to make Foursquare more useful for causes. “Wouldn’t it be great if Foursquare did ________ when you checked-in?” Let ‘em know and maybe it will be happening. But with growth spiking at Foursquare, and having recently launched in 50 more cities–and who knows how many more tomorrow–Den and the gang are busy. In short, cause marketers, especially us local practitioners, need to work with Foursquare as it currently functions. Foursquare isn’t a standalone product–at least not yet. The New York deal is fantastic, but for the short-term it will be the exception, not the rule. New York probably has more Foursquare members than any other city in the world. I suspect the numbers dwindle quickly after that. I saw something recently that Foursquare has 100,000 members worldwide [Please correct if I'm wrong here]. There’s no way I could replicate the New York deal based on Foursquare eyeballs alone. But I could package Foursquare alongside other assets into a solid marketing pitch. That’s what I’ll be shooting for. A synonym for Foursquare is “cool”. I’m a big fan of marketing social media alongside cause marketing because they both are timely, interesting, and just plain fricken cool. Explaining Foursquare to existing and potential clients has been a great way to show people that my team is atop the newest social media craze and ready to put it to work for them. Even if they have never ever heard of it before. Solidifying my team’s position as merchants of cool may be Foursquare’s greatest value to me to-date. Tomorrow I plan to share a few more details on how I plan to use Foursquare for a specific cause marketing program. In the meantime, let’s hear from you. Have you used Foursquare to raise money? Do you plan to? Any new ideas since I last wrote about it?